This year The Real Advent Calendar includes a free 28-page story/activity book illustrated by award-winning artist Alida Massari. With recent surveys showing that knowledge of the Christmas story is fading, this makes The Real Advent Calendar a meaningful and fun way for parents, grandparents and Godparents to share the Christmas story. 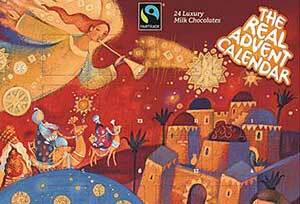 Behind each calendar window is a quality Fairtrade chocolate made from a new and improved blend. Unlike other manufacturers shea butter or palm oil is not used in Real Advent Calendar chocolate. Churches, schools and groups can buy in bulk directly from the Real Chocolate Company. Delivery is free if you order by 1 November. The best way is for a local organiser (or champion) to collect orders and place an order online. “It might be difficult to believe but recent surveys show knowledge of the Christmas story is fading. Among 5-7 year olds, 36% don’t know whose birthday is celebrated at Christmas and 72% don’t know that Jesus was born in Bethlehem. “Among adults, less than 12% know the full nativity story and 51% say that the birth of Jesus is irrelevant to their Christmas. This is a tipping point. Unless we actively share the Christmas story, Christ will continue to be written out of Christmas.